Apple compared the tablet computer to "misbranded drugs"
A California district court rejected Apple's bid to have Samsung's Galaxy Tab 10.1 prematurely banned from sale in the U.S.
Apple and Samsung are currently engaged in patent battles that could see a range of Samsung's products blocked from the U.S., and Apple petitioned the court last month to issue a preliminary injunction against the Galaxy Tab 10.1 before the conclusion of the trial. This was their second attempt, and like the last one in December, it was denied by California Judge Lucy Koh. Judge Koh's December decision to deny Apple's request to have the tablet (along with three other Samsung products) banned was overturned by the U.S. Court of Appeals for the Federal Circuit, allowing Apple to re-submit their request in May. But Samsung in turn appealed the decision of the appeals court, and Judge Koh said she's unable to grant Apple's request until the appeals court's process is complete. Judge Koh said that her California court "currently lacks jurisdiction to issue a preliminary injunction as requested by Apple because the Federal Circuit has not yet issued the mandate." Apple compares the Galaxy Tab 10.1 to "misbranded drugs"
Apple contested that there is indeed precedent to issue a premature injunction against the Samsung Salaxy Tab 10.1, citing a 1951 case in which a district court did the same to "protect the public from harmful, misbranded drugs." It's been pointed out, though, that unlike dangerous and misleading drugs, Samsung's Galaxy Tab 10.1 does not pose any danger to consumers. In fact, the only danger it poses is to Apple. "Each day that Samsung continues to sell its infringing Tab 10.1 causes additional harm to Apple through design dilution, lost sales, lost market share, and lost future sales of tag-along products," Apple said in their May request. But even that is up for debate. Judge Koh expressed concern about her court altering the status quo, but Apple and Samsung even disagree on what constitutes the status quo - before or after Judge Koh's December denial of Apple's injunction request. 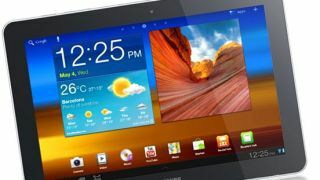 The court initially dedicated a hearing on June 7 to consider the Galaxy Tab 10.1, but that hearing will instead focus on Apple's attempt to ban Samsung's Galaxy Nexus smartphone.